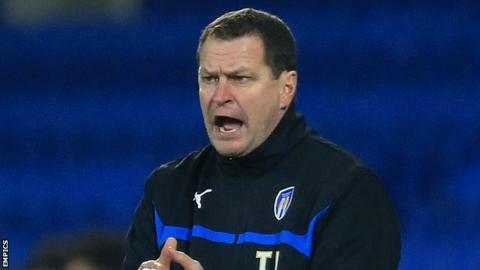 Colchester United boss Tony Humes has said he can withstand the growing criticism among supporters. The U's suffered a ninth home defeat of the season against Crewe on Saturday, in front of a restless crowd. "They can say what they want to me. We're taking the club in a direction and we're going to keep doing it," Humes told BBC Essex. "If people want to shout then they want to shout. I have to brush it off. If it's their opinion it's their opinion." Humes, 48, took over from Joe Dunne in September, but Colchester have remained in a relegation fight and are currently three points from safety. The U's, who sold top scorer Freddie Sears to Ipswich Town in January, have scaled back their playing budget in the last three years and instead focused heavily on youth production. But sections of the home support displayed their dissatisfaction at the weekend with a negative response to the result. "We've shown some good performances, I would just hope they would think about what the players need out on the pitch. The players don't need that," said Humes, whose side travel to Sheffield United on Tuesday. "They need the support, which I think the crowd have given us an awful lot over the season. It just seems that maybe it's a target now."